Bogdan, a reader of this blog, spotted a new Google Docs feature: server clipboard. It seems to be an implementation of Google Cloudboard, an online clipboard that should help you copy content between Google services like Gmail, Google Calendar or Google Docs. Cloudboard should make it easy to copy a spreadsheet in a Google Docs document or copy a Google Calendar event in a Gmail message. I couldn't find this feature in Google Docs, so it's probably a test. Hopefully, the new clipboard will work well in all browsers without having to change advanced settings. 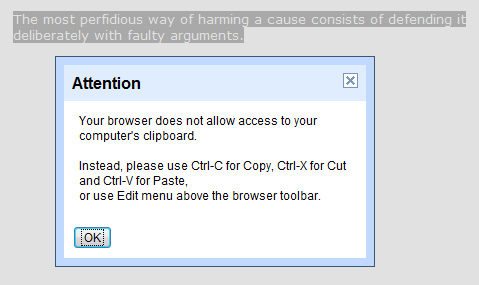 Right now, if you click on Edit/Copy in Firefox, Google Docs shows this message: "Your browser does not allow access to your computer's clipboard. Instead, please use Ctrl-C for Copy, Ctrl-X for Cut and Ctrl-V for Paste, or use Edit menu above the browser toolbar". "There are a few specific cases in which the best way to copy and paste is using the server clipboard menu. When you copy a selection using this menu, the content you copy is stored and associated with your Google Account. That means you can copy more than one selection and then choose which one to paste later; it also means you can copy something on one computer and then paste it on another." The article mentions that you might see "different formats that you can choose from to paste what you've copied (for example, HTML or plain text)". It's also interesting to see that Google stores all the content you copy to the server clipboard for 30 days. "Content you copy to the server clipboard is stored on Google's servers and remains there until 30 days have passed since you last took action on (for example, copied) a given content selection. Even if a document is deleted, anything you copied from that document to the server clipboard will still exist on Google's servers for that 30-day period. 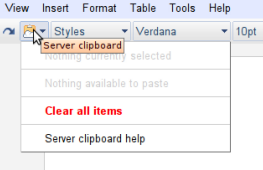 You can delete all items stored on the server clipboard by clicking the drop-down menu and selecting Clear all items." Seems to work pretty good. It would be nice if a chrome extension comes out for the cloudboard too. This new server clipboard overwrote a bunch of cells in my spreadsheet. I was copying one cell to another and instead I pasted many cells from an earlier copy operation, and there was no undo available. I lost data. Now I know what happened, thanks to this news item. You never lose your data in Google Spreadsheets: go back to an earlier revision. i was facing the same problem.. thank god i came across this app.... this app solved my problem.. its great, try it!